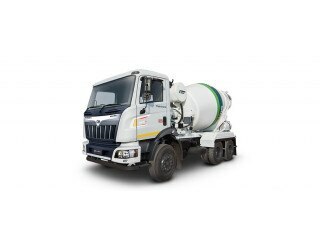 Dec 4, 2018: The Mahindra Blazo X 25 Transit Mixer competes with the likes of the similar industry focused trucks from Tata and Ashok Leyland. It has heavy duty aspects all around and comes with premium features as well. The truck is built on a chassis with a day cabin and has optional air-conditioning as well. The gross vehicle weight of the truck lies at 25 tonnes while the ground clearance stands at 250 mm. It rides on Semi-elliptical leaf spring suspension for the front axle while the rear gets the Bell Crank units. The braking is handled by air brakes along with the benefits of ABS as well. It is powered by a 7.2-litre engine that can churn out a maximum power of 274 bhp at 2,200 rpm along with a peak torque of 950 Nm at 1,100 rpm. A 6-speed manual unit does the transmission duties.